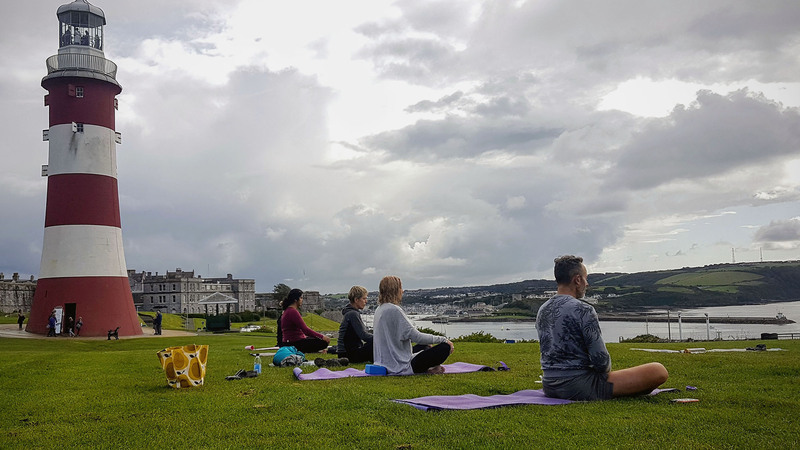 Join us for an outdoor Holistic Yoga session on the Hoe in Plymouth. If weather allows, our certified yoga teacher Paula will guide you through a sequence of yoga techniques and exercises such as meditation, asana (physical postures), a bit of breath work and gentle relaxation. This 90-minute experience is suitable for all levels, so it doesn't matter whether you are new to yoga or an experienced yogi who has practised for years, just come along. It's a chance to relieve your stress, achieve a sense of balance and calmness, reconnect with yourself and mother nature, and absorb a friendly group energy. While your body will be stretching, strengthening and detoxifying you can enjoy the beautiful view. After the practice you are invited to join a circle and share whatever you feel like sharing. I will be happy to answer any of your questions. And if you prefer to sit quietly then please do so. We will chant a few mantras together to close the session. Please bring water, wear something comfortable and avoid eating 2 hours prior to session. There will be 15 yoga mats and straps available to your use on the first-come first-served basis. If you struggle with any health condition please make sure you let us know by filling in our Health Questionnaire. Saturday, 16th September 2017, 11:00 am - 12:30 pm, free of charge.